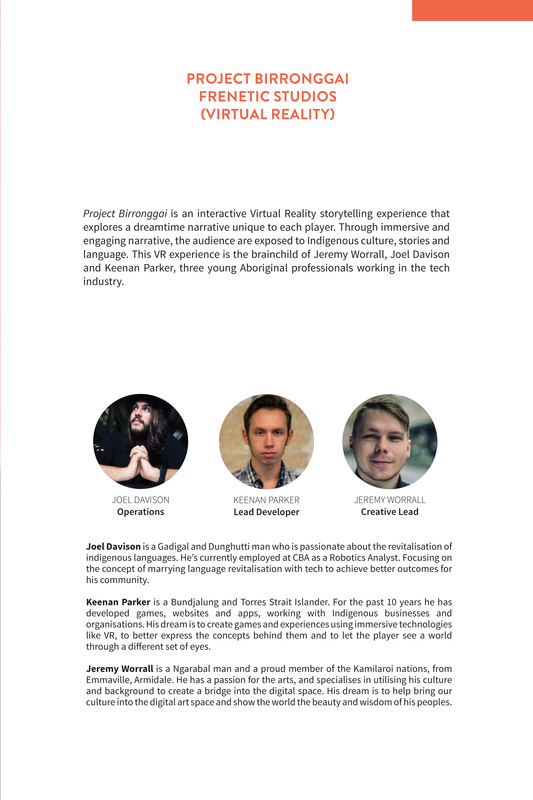 Project Birronggai is an interactive Virtual Reality storytelling experience that explores a dreamtime narrative unique to each player. Through immersive and engaging narrative, the audience are exposed to Indigenous culture, stories and language. This VR experience is the brainchild of Jeremy Worrall, Joel Davison and Keenan Parker, three young Aboriginal professionals working in the tech industry. Joel Davison is a Gadigal and Dunghutti man who is passionate about the revitalisation of indigenous languages. He’s currently employed at CBA as a Robotics Analyst. Focusing on the concept of marrying language revitalisation with tech to achieve better outcomes for his community. Keenan Parker is a Bundjalung and Torres Strait Islander. For the past 10 years he has developed games, websites and apps, working with Indigenous businesses and organisations. His dream is to create games and experiences using immersive technologies like VR, to better express the concepts behind them and to let the player see a world through a different set of eyes. Jeremy Worrall is a Ngarabal man and a proud member of the Kamilaroi nations, from Emmaville, Armidale. He has a passion for the arts, and specialises in utilising his culture and background to create a bridge into the digital space. His dream is to help bring our culture into the digital art space and show the world the beauty and wisdom of his peoples. Davison, Joel, Keenan Parker, and Jeremy Worrall. 2018. “Project Birronggai: Virtual Reality”. In Decolonising the Digital: Technology As Cultural Practice, 110-30. Sydney: Tactical Space Lab. http://ojs.decolonising.digital/index.php/decolonising_digital/article/view/ProjectBirronggai.